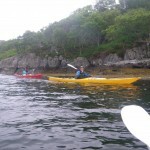 We have spent the last six days kayaking around the Sound of Arisaig with Wilderness Scotland. Most days we have arrived back at our accommodation with just enough time for a quick shower before heading out to dinner at a local pub, following which I’ve collapsed exhausted into bed with no time to write a daily blog post. For the last three days we haven’t even had wifi, so the only available internet has been outside where the midges attack mercilessly. The first day we were driven from Inverness to the village of Strontian “the village that gave it’s name to the element” according to a prominent sign. In the 18th century, there were about 800 lead miners working near the town, but now it is just a sleepy village. 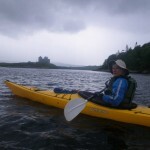 It was late afternoon by the time we arrived, so we only had enough time for about an hour on the water of Loch Sunart. 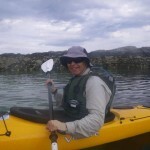 Our head guide Luke Partridge gave us a few tips on how to improve our forward paddling. Every instructor has a different way of teaching, and Felicity and I both learned things which should improve our technique. On the second day Felicity was feeling unwell, so she decided to stay behind. She ended up going for quite a long walk, and had a close and protracted encounter with a pine martin, so she didn’t feel the day was wasted. 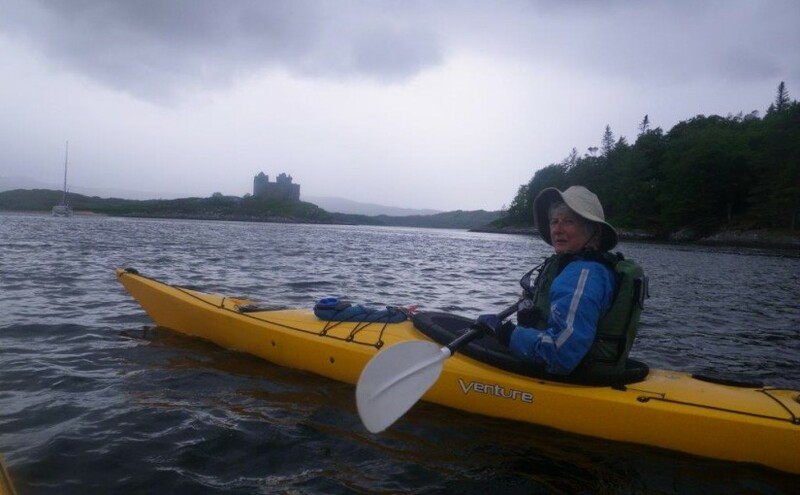 It was fairly windy, so we drove quite a long way to Loch Ailine (looking at Google maps as I am about to publish I think I might have got this wrong), and paddled out to near the coast. 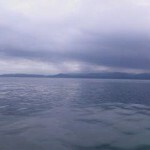 We had hoped to be able to circumnavigate an island at the end, but the sea was too rough and we stayed in sheltered water. 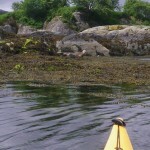 We saw a lot of seals, both in the water and on the rocks. Many were mothers and pups, and I managed to get a photo of one pair before they slid into the water. Driving in the van on the way back from dinner we saw a pine martin run across the road in front of us. We also saw a couple of bats swoop down and catch moths attracted by the headlights. They almost got hit by the van, but I suspect they are expert at this hunting technique because I have never seen dead bats on the road. 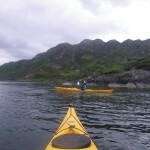 The next day Felicity was feeling better so the full group of seven explored Loch Moidart. 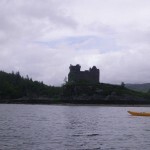 We put in near the ruin of Castle Tioram, which was built in the 13th Century as a stronghold of the MacDonald clan. The MacDonalds supported the English during the uprising, so they decided to burn the castle to stop it being captured and used as a Jacobite stronghold. 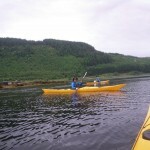 As we continued down the loch, we watched a huge sea eagle above the trees being chased by a much smaller crow. The eagle is the top predator in this area, and had no doubt spied the crow’s nest and chicks. A little later I spotted the eagle sitting on a beach not far away, and as I shouted to the others it took off and flew low right across in front of us, giving us great view. The wingspan of these birds can be up to three metres, and the white tail splays out in fan shape as it flies. We stopped for lunch on a sandy beach, and while the guides were brewing coffee I realised that the sun was almost shining through the clouds so Felicity and I quickly stripped off and plunged into the water in case that is the most sun we see on the trip. Because the gulf stream from the tropics flows around the British Isles, the water isn’t as cold as might be expected, but we didn’t stay in long nonetheless. The tide was coming in fast as we ate, and we had to shift the boats further up the beach a couple of times to prevent them heading off to America without us. The sandy spit was so narrow by the time we were ready to leave that we dragged the kayaks right over and launched on the other side. The next few kilometres were in the open sea, with quite a big swell making us bob up and down. 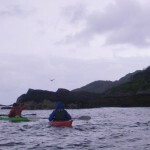 We are still adjusting to kayaks which use a skeg, so it was on the edge of our comfort zone as we travelled along watching waves crashing on to the rocks and cliffs on one side, and breaking over off-shore reefs on the other. I was glad to have a couple of guides ready to rescue us if things went wrong. 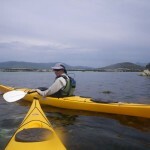 Eventually we rounded a point and paddled back into calmer water. 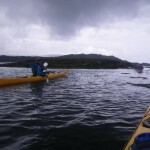 We were circumnavigating Eilean Shona (the beautiful island), which was once owned by J.M.Barrie, author of Peter Pan. 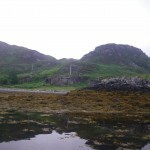 The guide pointed out the old schoolhouse, which was built on the other side of the island from the house so that Mrs Barrie could have space from their children. 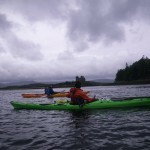 Day four was very windy, so we launched the kayaks in front of the lodge and practised turning and using our skegs to keep on course with the wind behind us. This was a bit of a challenge for me and Felicity because we are used to kayaks with rudders that you can steer with foot pedals. We hugged the coast to the west until we came to a sandy beach on a small island, and there we stopped for lunch. 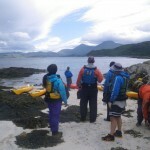 We continued up the coast, steering in and out of rocks, and using waves to surf over shallow reefs. 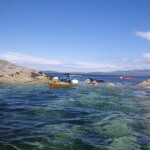 When we came to where we would have been exposed to rough seas we turned around and paddled back around the outside of our lunchtime island. This was directly into the wind, and very hard work. The final full day was by far the best. We woke up to blue sky and sunshine, and best of all, very little wind. 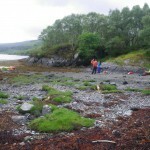 We drove up the coast past Arisaig, and launched at the mouth of the river Moror. For the first time we decided not to wear our heavy clags (jacket) because it would have been too hot. This proved to be a good decision because the temperature actually made it into double figures! As we were leaving the river mouth we had to paddle through a line of breakers, which didn’t worry me at all, except that one broke right over the bow of my kayak and I got rather wet. 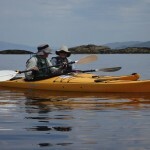 We paddled quite a long way south down the coast, exploring a rocky reef along the way. 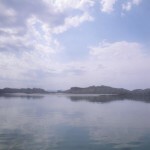 The water was so calm it was glassy – we couldn’t have had more enjoyable conditions. 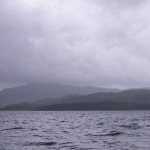 We had fantastic views of the mountains of Rum and Skye further out in the Atlantic. Late in the morning we heard a rumbling from the mainland, and looked back at distant mountains to watch a thunderstorm, with huge bolts of lightning. Fortunately it was far away, and not moving in our direction. 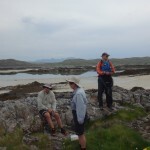 By early afternoon we reached our destination, the Arisaig Skerries. 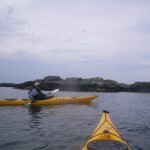 These are a group of white sand beach-fringed islands which are home to countless seals, otters and sea-birds. The water is amazingly clear, and when the sun shines it is a beautiful turquoise colour. 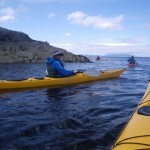 This is rightly promoted as one of the best sea-kayaking day trips in the world. On such a beautiful day it was also packed with dozens of other kayakers, but we managed to find a small island to ourselves for lunch. Felicity and I went for another quick swim before eating. 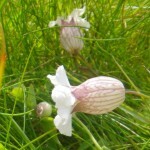 At the the top of our island there was a small grassy spot in the rocks to relax on – there were even lots of wild flowers to admire. Our guide Luke collected several varieties of edible seaweed for us to try – some we ate raw, some he blanched quickly in boiling water, and one lot he even fried in butter, which everyone agreed would make a nice bar snack in a pub. 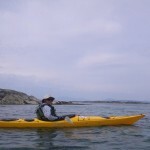 We were paddling in and out of the small channels looking at seals and their pups when Luke spotted an otter swimming nearby. As we were watching it got out of the water and climbed over a rock right in front of us, so we got a really good look. 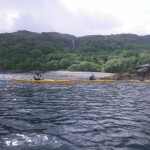 The wind had come up a bit by the time we started paddling home, but it was from the side rather than in our faces. The sea got quite a bit more lumpy, and a couple of the group started feeling a bit sea-sick, but Felicity and I felt fine. All together we paddled 23km so again we were feeling rather tired, but satisfied with our day’s adventures. 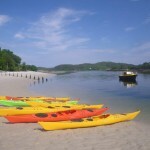 On the final day there was only time for a couple of hours paddling in the morning, so we headed east from the lodge into Loch Ailort, then out to an island which has a Gaelic name that I forget which translates as “stranger island”. There is a ruin of a vitrified fort here, where the rocks are fused together by intense heat. Archaeologists are not certain how of why this was done, but the most likely explanation is that the forts were deliberately destroyed by fire. 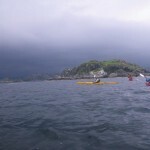 The wind was picking up a bit as we paddled back to the mainland and back along the coast. Even though the weather has not been quite as summery as we had hoped, it has been a great adventure, and we have enjoyed sharing it with all the members of our group. Been missing my early morning coffee in bed reading your Scottish adventures! 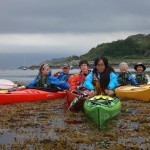 The kayak trip looks like it was amazing. I’ve just added three more photos of us taken by Stefan Holberg, taken from his complete collection here. There are even more photos of our trip here, taken by our guide Sarah.